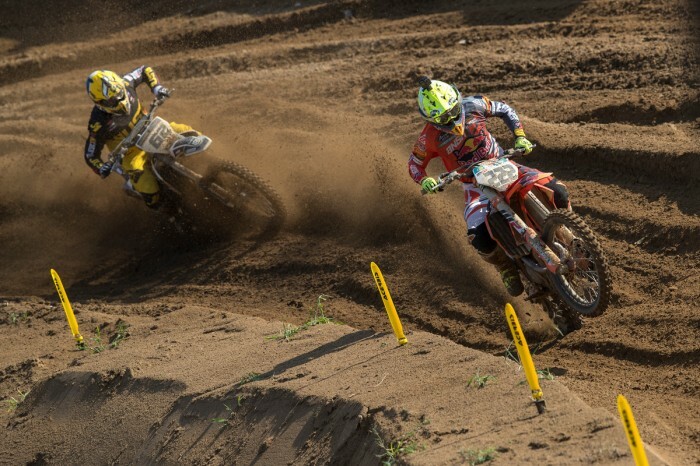 With his main championship rival and team-mate Jeffrey Herlings sidelined with a broken collarbone sustained in a practice crash last week, Tony Cairoli (Red Bull KTM) raced to a double win at his home MXGP of Lombardia today to slash the deficit to the Dutchman to just 12 points. The veteran Sicilian, who’s going for a record-equalling 10th world title this season, had to pick himself off the ground in Saturday’s qualification race. He was forced to do the same in today’s second moto but his 50-point maximum has hauled him back into contention heading into Indonesia in a fortnight’s time. He was joined on the podium at round 11 of the FIM Motocross World Championship by France’s Gautier Paulin (Rockstar Energy Husqvarna) and his British team-mate Max Anstie who’s looking to turn his season around after a disappointing first half of the campaign. In searing heat Cairoli holeshot the opening 30-minute plus two lap race from Romain Febvre (Monster Energy Yamaha) and Clement Desalle (Monster Energy Kawasaki) with Anstie fifth, two places ahead of Northern Ireland’s Graeme Irwin (Hitachi ASA KTM UK). Cairoli wasted no time in opening a gap but Febvre was pushing too hard to stay with him and a big mistake let both Desalle and Anstie through before a fall dropped him back to sixth. In the closing stages Anstie pushed Desalle hard but couldn’t get close enough to show the Belgian a wheel and then fell on the final lap but restarted without losing a place. At the flag Cairoli was almost 12 seconds ahead of Desalle with Paulin fourth ahead of Febvre and Tim Gajser (Team HRC). After his great start Irwin slipped back to 18th with Scotland’s Shaun Simpson (Wilvo Yamaha) picking up a DNF and it was even worse for Tommy Searle (Bike It DRT Kawasaki) whose bike cut out behind the start gate. Veteran Belgian Kevin Strijbos (Standing Construct KTM) holeshot race two as Cairoli ran wide around the 180 degree first turn but within three corners he was into the lead with Desalle third from Glenn Coldenhoff (Red Bull KTM) with Gajser sixth, Anstie 10th, Simpson 13th and Irwin 15th. After four minutes Cairoli was already two-and-a-half seconds ahead but he washed out his front wheel in a left-hand turn and crashed back to fourth, handing the lead to Strijbos. Quickly back up, Cairoli wasted no time in passing Desalle for third and when Gajser moved into the lead in the wave section he followed him through and then passed the Slovenian to retake the lead. With track conditions becoming increasingly brutal, Desalle crashed twice – the second one a big impact. He restarted just in front of Simpson who clipped him and crashed and Desalle was then forced to pit with a rear brake problem as a result of the collision. At the front Cairoli was in total control, taking a second-a-lap out of the chasing pack before hitting cruise control in the closing stages. Paulin held third from Febvre who then lost two places to Anstie and Jeremy Seewer (Wilvo Yamaha) in one turn which gave the Brit the final place on the podium behind Cairoli and Paulin. Searle was 13th with Irwin 16th but it was a miserable day for Simpson who salvaged a couple of points in 19th, one place ahead of Desalle. The championship now takes a weekend off before resuming at Pangkal Pinang in Indonesia with Herlings still leading Cairoli and Desalle 100 points further back in third.